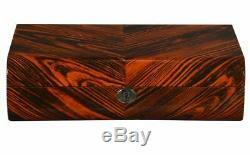 This exquisite & unique handcrafted luxury zebra wood watch box makes the perfect addition to any watch collection. This chest is constructed of fine natural hard wood, hand-polished to a high gloss mirror finish, while the interior is lined with light grey velvet with removable pillows. 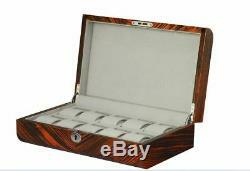 The watch box will hold 10 watches and includes lock & key. Zebra wood finish with grey velvet interior. Dimensions: 13 x 9 x 3.5 inches (L x W x H). Please inspect all items when received. The item "NEW Zebra Wood Finish Ten Watch Box Storage Chest Display Case" is in sale since Saturday, January 13, 2018. This item is in the category "Jewelry & Watches\Jewelry Boxes & Organizers\Jewelry Holders & Organizers\Watch". The seller is "fivestartradinginc_com" and is located in Pompano Beach, Florida. This item can be shipped to United States, Canada, Mexico.